Inscription: C.KNAPPS SON & Co. (arched) / THE LEADING BRAND. (reverse arched around a frosted circle). 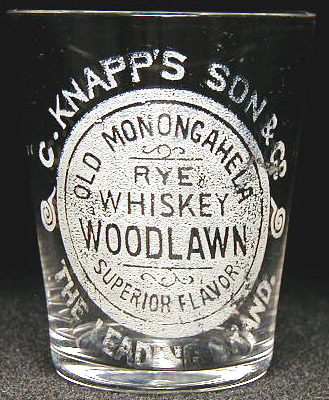 Circle represents barrel end and reads: OLD MONONGAHELA (arched) / (line design) / RYE / WHISKEY / WOODLAWN / (line design) / SUPERIOR FLAVOR (reverse arched). Dimensions: 2-1/2" x 2-1/8" x 1-1/2"
Condition: There are fine handling marks in the wall of the glass but no damage. The label is crude and appears to have flaked in places, perhaps due to abrasion. Nice overall!